They make a great and very thrifty gift and there is still time to make some in time for Christmas. They will be appreciated! Before cutting them up wash your lemons. Even if they are organic they may have been waxed, which helps keep them fresh, but delays the pickling process. 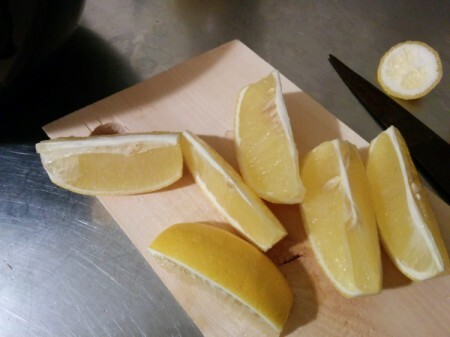 Cut the ends off each lemon. Cut the the lemons into 6-8 wedges each depending on their size. 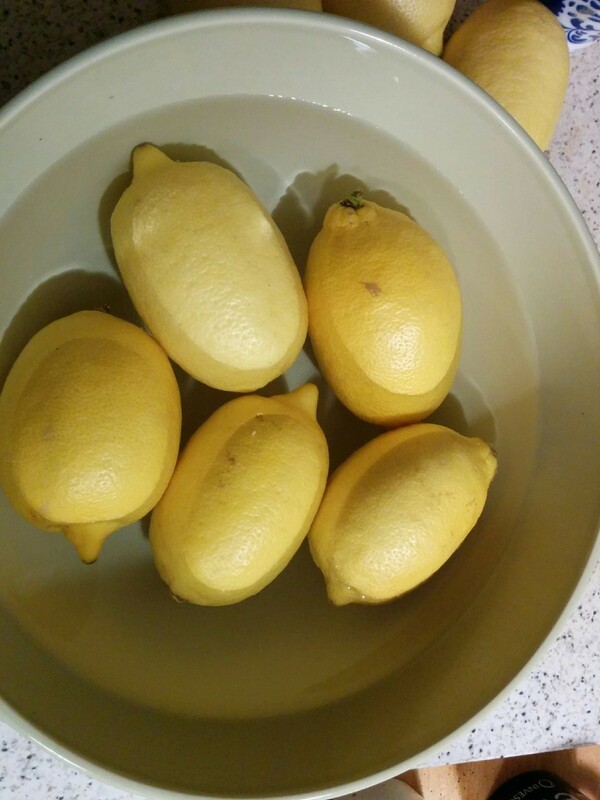 Put the lemon wedges into a glazed ceramic bowl giving each one a gentle squeeze as you do so to break the membranes and release some of the juice. Careful not to squeeze them dry. Sprinkle on 40 oz of the salt reserving 1 oz for when you put the lemons into the jars the next day. Weigh down the lemon wedges. 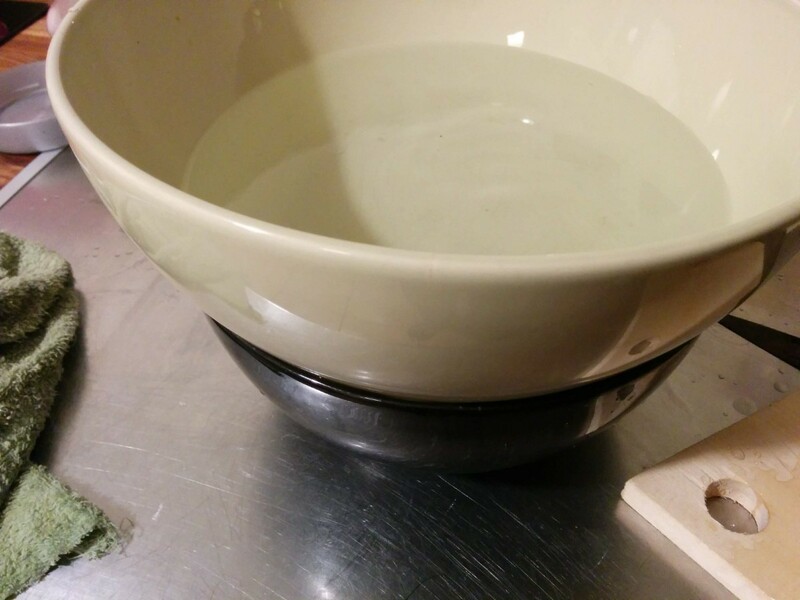 In the picture you will see I used another ceramic bowl filled with water. Set aside for 24 hours. When you lift off the weight you will see a lot of juice has come out of the lemons (and probably some pips too I scoop them out and discard them). 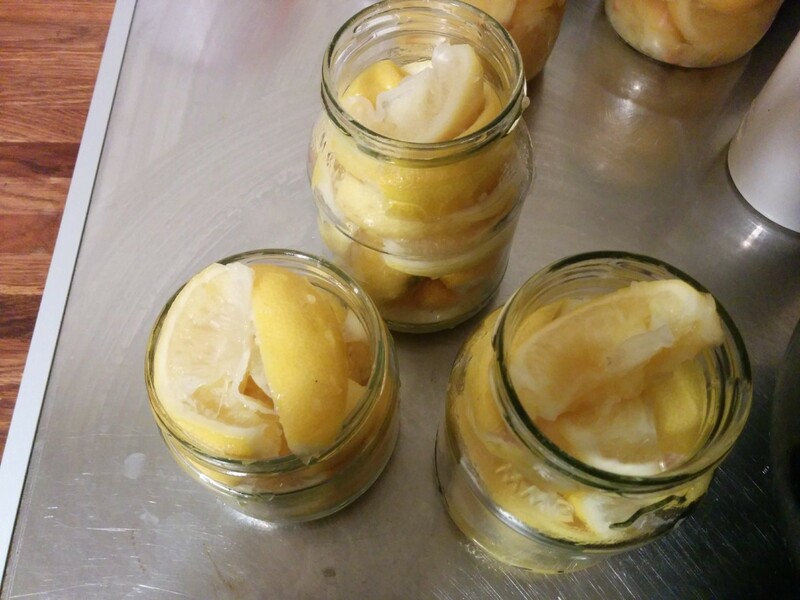 Lift the lemon wedges out of the salt/juice liquid with a slotted spoon and put them into a clean jar. Pour over the juice and once it has filled the air gaps put the reserved salt into the top of the jar. It is important that all the wedges are completely covered with liquid so top up the jar with hot water from the kettle. 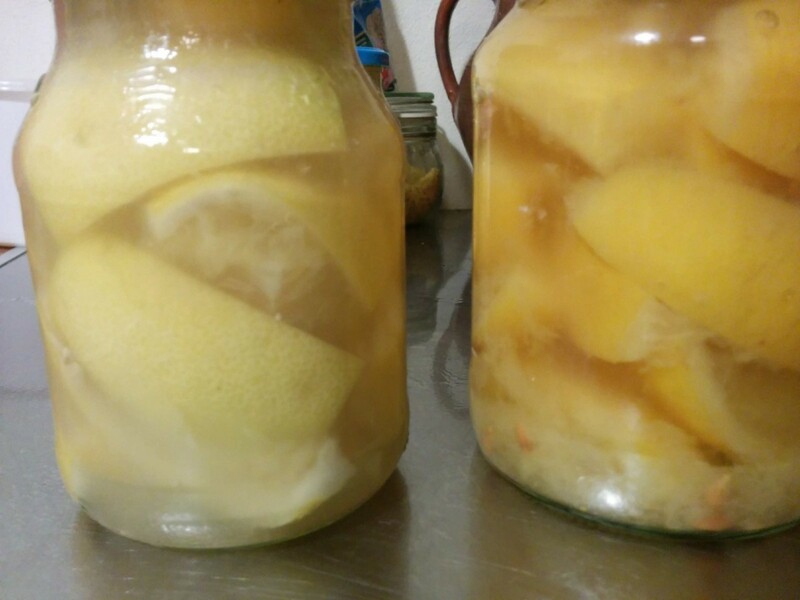 Place on the lid, tighten it, invert the jar a couple of times and then remove the lid and top up with water form the kettle if all the lemons are not covered. 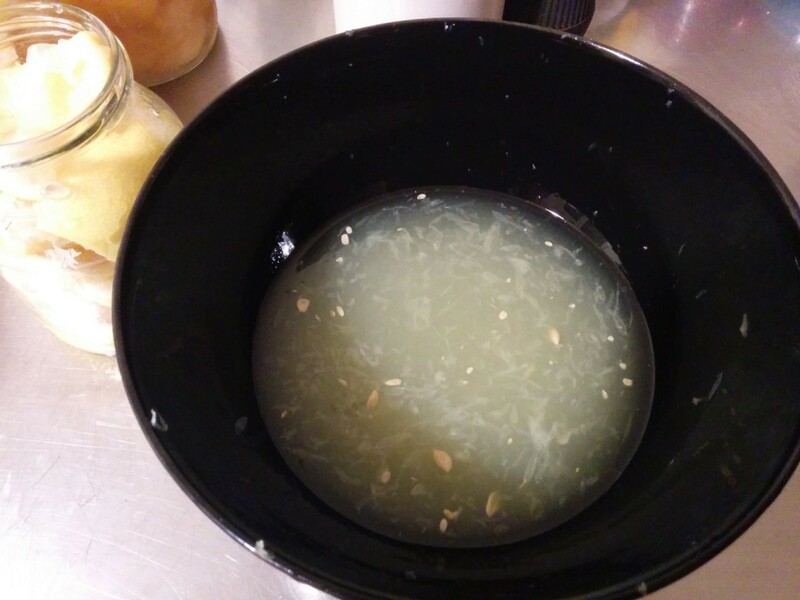 You need to invert/shake the jar every day for 2 weeks then once a week until you can see the lemon skins are translucent. They will last a year unopened and several months in the fridge once they are opened. In this picture is a newly made jar on the left and ready to use jar on the right. 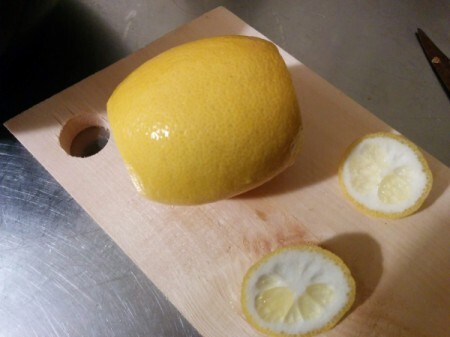 You can see that the ready to use ones are a darker yellow this and when the skin is translucent are both ways to tell the lemons are ready to use. How cool is that! 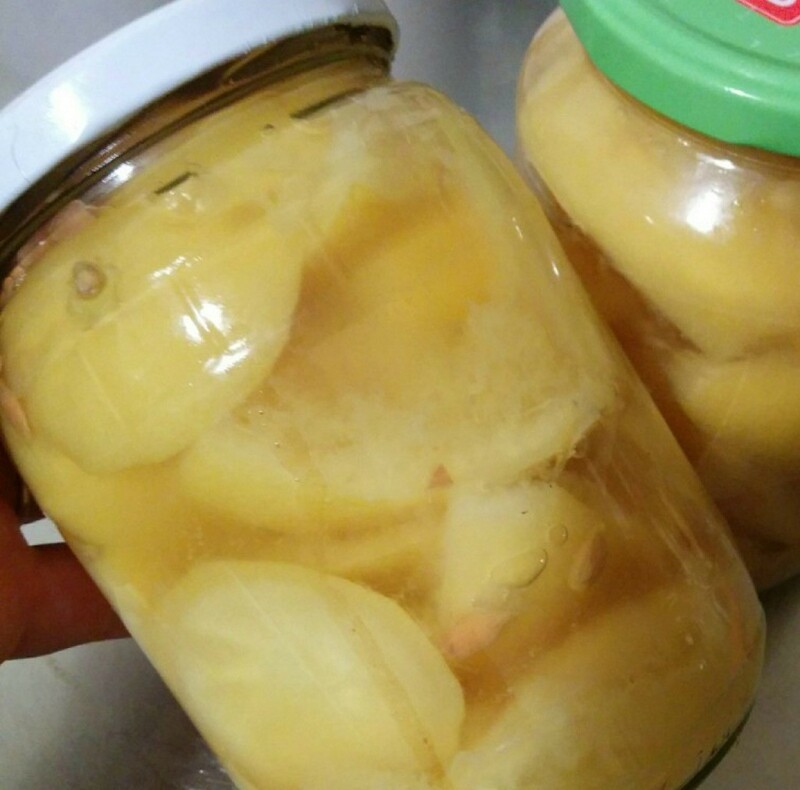 I'm a lemon lover and have never in a million years heard of this awesome way to preserve lemons. I thought it was impossible. Thank you so much for sharing!